We are now offering the option to give online through Tithe.ly. This is a safe and secure way to contribute to the ministry of Cornerstone Community Church. Click the give button to give a one-time gift or set up regular recurring gifts to be automatically drafted from your checking account, debit card, or credit card. You can even use this to contribute to our different giving funds at Cornerstone. Please leave a comment in the memo field if you you are paying for an event or resource from church. 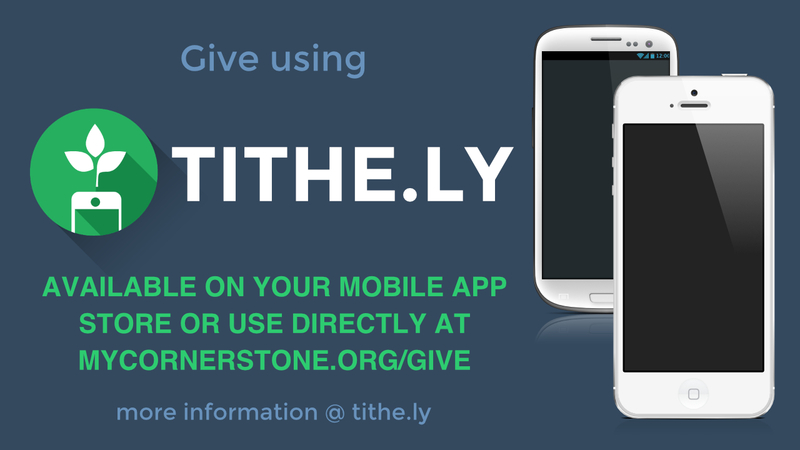 You can download the Tithe.ly giving app on iPhone or Android. While we do accept Credit and Debit card transactions, we do not encourage debt, or giving above your means. Cornerstone is supported through the generous giving of those who call Cornerstone home and by those who feel led to partner with us in this ministry. We do not pass a collection plate to take up a morning offering; instead, we have offering boxes located by the two main doors in the main Worship Center. We have offering envelopes that you can use for your checks and cash. And, of course, some people prefer to use regular mail (PO Box 757, Galax VA 24333). Please do not send gifts to our street address. Thank you for partnering with us in this ministry. If you have questions about our different funds and our policies for giving to Cornerstone, you can read more here on our website about our Giving Policies. You have complete flexibility. You can make a one-time gift or set up recurring gifts. Set the schedule you desire. Start, stop or change the schedule or amount at anytime. You are in control.